I would like to immediately increase my “Full Retirement” age for the purposes of Social Security from its current 67 to 69. And I would like to change the formal date of “Full Retirement” for all those 53 and younger. 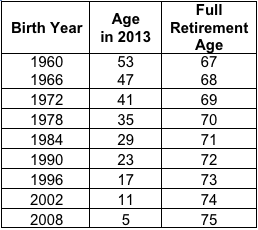 I select 53 because if you are older than 53 (were born prior to 1960) then your “Full Retirement” age was already incrementally increased by the National Commission on Social Security Reform in 1983. Yes, we have been through this before. All those that were born before 1960 were given retirement ages dependent on their birth year and those born after 1960 were given the same retirement age of 67. For those of us under the age of 53, our life expectancies have continued to increase while our start date for receiving benefits has remained constant. This is the very definition of unsustainable when it comes to retirement income. To our benefit, being younger than 53, we have 14+ years remaining in our formal working life — we have the time to plan, make the right choices and save to supplement our future retirement income. I fully understand that this will mean that I will lose two full years of retirement benefits that are currently due me under the present system. I fully understand that if I wish to retire those benefits two years earlier, I will need to take responsibility for the additional income myself. For folks older than myself and younger than 53, I believe they should retain a greater share of their expected Social Security income and for those that are younger than myself (my children included), I believe they should plan to receive a smaller share of their current expected Social Security and Medicare benefits by starting to receive those benefits even later. Below you can see my own admittedly simplistic method of displaying this possibility. I am sure there are many other ways to do it both fairly and with minimum harm. As a simple contextual tool, you can see that I am recommending that my five-year-old daughter wait eight years more to receive her full Social Security benefits than an individual who is 53 today. Will this make my daughter happy, when she discovers that I lobbied for lower federal benefits? Maybe not – sort of depends on what I bring her up believing she is entitled to. But, is it fair? I believe so. It is true that she will receive her financial benefits later in life than the generations that proceeded her, but she will also certainly benefit from the lifestyle-improving products and services that were created and produced by those earlier generations (just as they benefited from the work of generations before them). The benefits of the medical research alone will help her live a longer, healthier life. She will benefit from standing on the shoulders of prior generations, as every generation does. She will live longer for it and so should expect to work longer as well – both to provide for herself and her family, and to improve the knowledge base for the continued improved life and health of generations to come.As a simple contextual tool, you can see that I am recommending that my five-year-old daughter wait eight years more to receive her full Social Security benefits than an individual who is 53 today. Will this make my daughter happy, when she discovers that I lobbied for lower federal benefits? Maybe not – sort of depends on what I bring her up believing she is entitled to. Further, if I should be in the top 20% of income earners in retirement based on whatever tax code is in force at the time, I will happily forego some percentage of my Social Security and Medicare benefits. I do this as a citizen of a great nation and as a citizen of humanity acknowledging that the nation cannot afford all the benefits we have promised and that, if I do happen to be among the top earners, there are people for whom the need will be greater than my own. If I happen to be among the top 10% or even 5%, then I expect to receive an even smaller share of my otherwise expected federal benefits. Fully understanding the probable disagreement on the topic, I wish to state that I am firmly a member of the (probably upper) middle class and I simply believe this is the right thing to do. I am a fairly ordinary business person. I worked awfully hard and took many risks to get where I am, but I didn’t do it alone. I grew up with a supportive family, I received a very good education and I am surrounded by a superb staff for which I am extremely grateful. I am hopeful regarding my own long-term success, but I understand I am in no way guaranteed that success. Wallace Stegner wrote in a book of essays, “American individualism, much celebrated and cherished, has developed without its essential corrective, which is belonging.” I am a business person and a capitalist and I believe that great benefits are derived from the flow of capital between individuals making their own free choices of what products and services to buy and sell. This being said, I BELONG. I belong to the human race and I belong to America. I am one constituent among many. If we are to have a system that will benefit future generations, I believe we must make important changes to that system today. Even with the knowledge that I may at some point rely on Social Security (which I hope is never the case), I will freely relinquish a portion of my benefits for the long-term sustainability of the system. I suspect that others would willingly do the same if the changes were incremental as suggested above and if they had time to make alternative plans. Given the stark reality of our retirement income situation, it is time for each of us to give some of our benefits back so that future generations may have any benefits at all. Please push my full retirement age up to 69, my children’s to 74 and 75 respectively, and focus the potential pool of benefits on those that will really need them in retirement. Jonathan K. DeYoe, AIF and CPWA, is the Founder and CEO of DeYoe Wealth Management in Berkeley, Calif. Want more information? Follow DeYoe Wealth Management on Twitter at @DeYoeWealth or on Facebook at www.facebook.com/DeYoeWealth. Jonathan DeYoe, California Insurance License #0C21749, is a registered principal with and securities and advisory services offered through LPL Financial, a Registered Investment Advisor – Member FINRA/SIPC. The opinions voiced in this material do not necessarily reflect the views of LPL Financial and are for general information only and are not intended to provide specific advice or recommendations to any individual. For your individual investing needs, please see your investment professional regarding retirement planning.